I purchased Eden BodyWorks Jojoba Deep Conditioner, one day when Sally’s was a running on a buy two and get one free sale. As a fan of Eden Bodyworks, I wasn’t hesitant in taking advantage. 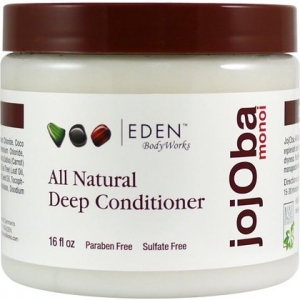 The Jojoba Deep conditioner was one of the products I choose to fulfill the sale requirement. Not only was I getting a great deal, but I was replacing my stash of deep conditioner. I had recently run out and was in desperate need of more. Eden BodyWorks Jojoba Deep Conditioner, comes in a hefty sixteen ounce container, which was one of the biggest containers I had purchased in a very long time. Normally I purchase deep conditioners that come in about eight ounces. Which lasts me about two months or so, depending on how often I use it. I figured since I was basically buying double my regular amount, it would last me a while. things I noticed about this deep conditioner is the fragrance. It’s not really a distinct scent, but it is strong. It doesn’t smell the greatest either. Not to say that it smells bad, but it certainly isn’t floral or fruity. The deep conditioner is a pale milky color, with a creamy consistency. It’s pretty thick and not at all runny. It gives the impression of being a oil lotion moisturizer. Which is something I liked right away. In the past I have used deep conditioners that felt I was like applying a cheap lotion to my hair. I was confident that with this deep conditioner wouldn’t be that away. The directions say to apply to clean wet hair, and comb through for thorough distribution. Then, leave it for fifteen to thirty minutes and rinse and style like usual. For more intense conditioning use with heat. replenish, strengthen and restore hair to it’s natural beauty from over processing, damage and dryness. Since my hair is pretty coarse, I tend to suffer with dry hair. The conditioner is good for use on all textures and hair types. As with all Eden body work products, they are formulated without sulfates, minerals oils, dyes and parabens. You’re also getting ingredients that include coconut oil, glycerin, jojoba, carrot seed oil, camomile, tea tree, sweet almond, castor oil, vitamin e and aloe. my head with a plastic bag and allowed the conditioner to sit for thirty minutes before rinsing. The deep conditioner wasn’t that difficult to rinse, in fact, it rinsed away upon the first try. There was no left over residue on my edges or in the places I applied the conditioner heavily. After patting my hair dry, I noticed how soft to the touch it was. Even in my crown, my hair was equally soft. Detangling was a breeze andI was even able to use less moisturizer too. I found that for my hair, the best way to use this conditioner was every other week instead of once a week. There were times were I used it when my hair was in need of some deep conditioning in between wash days, but that was pretty rare. linger in my bathroom long after usage, and seriously cling to my hair. Even after using my leave in conditioner that is a totally different fragrance, I could still faintly smell it. Given the great results of soft, manageable hair that has little to no tangles, the fragrance is tolerable. I have had this deep conditioner for more than a month, and I am barely half way through the jar. I use a pretty good amount on my hair that is collar bone length. So to say, I can see myself not having to replace deep conditioner for a while. In the end, I really like this deep conditioner. With my sally’s beauty card it costs $7.99. Depending on where you shop it can range from $7.99 to about $10. In my opinion, for all that ingredients and the amount you are getting, it’s a pretty good investment.